The animals of Kenya are almost too numerous to mention. Together with the national parks, the presence of huge amounts of wild animals have earned Kenya the reputation of the world’s safari capital. This page lists the most important animals of Kenya. Also have a look at my general introduction of Kenya's animals or my pages about Kenya’s birds, which Kenyan wildlife you can spot in which national park, and endangered wildlife in Kenya. Baboons are ground-dwelling monkeys that live in packs known as troops. They are quite large, and are aggressive enough to defend themselves against large predators, even the leopard. Living in the open savannah, they are omnivores that eat anything from plants and insects up to small antelopes. 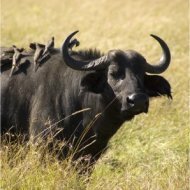 The African buffalo (also known as the Cape buffalo) is one of the "Big Five" game animals of Kenya. They live all across the country, in both the grasslands and the forested regions. The buffalo found in the savannah are quite a big larger than those in wooded areas. These animals of Kenya are unpredictable in behaviour, and gore people who get too close. The bush baby is a common name for the galago, a very small primate that lives in the trees. These nocturnal animals have very large eyes and ears for hunting insects in the dark. Known best for its remarkable speed, the cheetah is one of the major predators of Kenya. A cheetah can reach speeds of over 70 mph, though can only maintain such speeds for a short time. Their spotted coat is similar to the jaguar or the leopard, but the cheetah has 2 black "tear marks" on its face. They live in small groups and hunt animals like the gazelle and wildebeest in the grasslands. A number of crocodile species live in Kenya. Animals like the zebra or wildebeest are often attacked by crocs as they come to the water's edge to drink. Crocodiles are a threat to humans as well. The Mara river, that runs through the famous Masai Mara game park, is known to be particularly dangerous because of them. The African elephant ranks as another Big Five game animal, and lives in many areas of Kenya. Shimba Hills Reserve is particularly well-known for it's large elephant population. Large herds of elephants can wreak havoc on the local vegetation though. Though protected, they are still poached for their ivory tusks. Herds of speedy gazelle can be found grazing in the open grassland. These graceful animals of Kenya have long curved horns, and have a peculiar habit of leaping straight up in the air when pursued by a predator. They often fall prey to lions, leopards, cheetahs or even crocodiles. The unmistakable giraffe is the tallest animal on the planet, reaching heights of 18 feet. They are browsing animals that eat branches and twigs from trees, something they are well suited for. Giraffes are not particularly endangered in Kenya, mainly because they can co-exist with cattle and are not adversely effected by spreading farmland. It may not look like it, but the fat hippopotamus (or hippo) is considered to be among most dangerous animals of Kenya. They are hostile and violent animals that can attack without warning or provocation. Hippos are even known to push aside adult crocodiles for their prey. Though they cannot actually swim, hippopotamuses spend most of them time floating submerged in lakes and rivers. The dog-like hyena is one of the larger scavengers of Kenya grasslands, stealing prey or eating other animals leftover carcasses. Their cries can give the impression that they are laughing, and their gait is distinctive because their front legs are longer than the back. The hyena's strong jaws can crush bone. Another one of the Big Five, the leopard is known for dragging its prey into the scrub trees of the savannah to keep away from scavengers. The all-black variation of the leopard (called a black panther) is sometimes seen in the forested regions of Kenya, but never on the plains. For prey, a leopard will take whatever it can find, including much larger animals. Their population is fairly large throughout this part of Africa, and they are not particularly endangered. 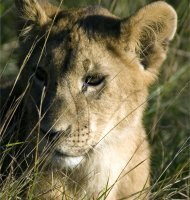 A pride of lions is very symbolic of all African wildlife, and they are popular animals with safari travelers. For seeing lions, the Masai Mara National Reserve is a particularly good location. A single male rules each group, but the females do all the hunting. Their social behaviour is unusual for cats, which typically live a solitary lifestyle. Lions will prey on any of the large grazing animals, including gazelles, zebras or wildebeest. Ostriches are large flightless birds that live in small groups on the plains of Kenya. They lay their eggs in "nests" scratched into the bare earth. Ostriches eat mainly plant material, along with insects. Their long legs can give a powerful kick to ward of predators, and they can run at a steady speed of 30 mph. There are 2 species of rhino in Kenya, the black and the white (though they are both gray in colour). The black rhino is critically endangered worldwide, with the white rhino only having a handful of individuals living in Kenya. White rhinos have much larger populations farther south in Africa. Though protected, they are still frequently poached for their horns. The warthog is a member of the pig family, and is very recognizable by the tusks and "warts" on its head. Their tusks are used to dig for roots, and to dig their burrows. They are common animals in most regions of Kenya. Warthogs are not considered to be among the endangered animals of Kenya. The grazing wildebeest are among the most famous animals of Kenya because of the yearly migrations through the Masai Mara National Reserve. Millions of animals migrate together, creating a natural spectacle. Wildebeest are related to cows and antelopes, and they are also called "gnus". The striped hide of a zebra is unmistakable. Living in Kenya are 2 species of zebra, the plains zebra and the Grevy's zebra. The plains species is quite plentiful throughout eastern and southern Africa, whereas the Grevy's zebra is limited to Kenya and considered endangered.